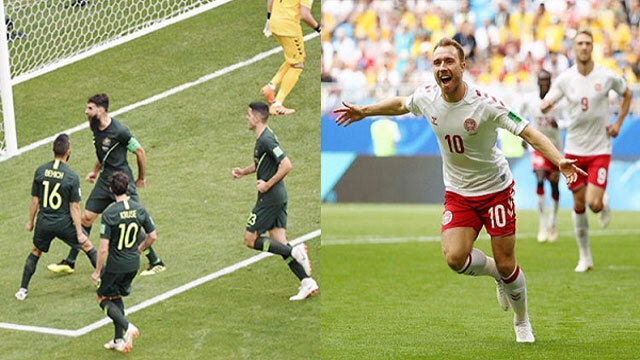 Dhaka, Jun 21 (Just News): Captain Mile Jedinak rode to Australia's World Cup rescue with a penalty to cancel out Christian Eriksen's superb opener for Denmark, securing a 1-1 draw on Thursday that ensured Group C would go down to the wire. Jedinak, however, got Australia back into the game with his second penalty in Russia, awarded following the intervention of the VAR, and the draw kept the Socceroos alive in the tournament. Denmark moved on to four points and need at least a draw against France in their final game to guarantee a last-16 spot, while Australia, with one point, must win their last match against Peru to stand any chance of going through. After their opening defeat by France, Australia coach Bert van Marwijk resisted the temptation to draft in attacking reinforcements, leaving veteran forward Tim Cahill on the bench for the second match in a row. They should have doubled their advantage when Jorgensen flashed a header wide at the near post as Australia looked ragged at the back and toothless up front. They could not turn that impetus, however, into clear chances. After Denmark's Pione Sisto put a good opportunity wide, Australia gradually got on top, but the nearest they came to a winner was when Leckie's cross was turned over his own goal by Henrik Dalsgaard and Mooy blasted over from distance. Second-half substitute Daniel Arzani brought an additional spark to the Australia attack and had a good shot parried by Schmeichel at the death while Leckie tested the Danish keeper with a hooked effort.